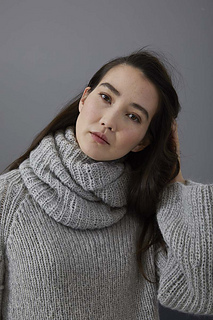 The sweater and separate cowl are knitted with 1 strand of Lusso and 1 strand of Cashsoft Baby. LANGYARNS LUSSO (extra fine merino, silk, camel, super kid mohair) 250/300 g = 10/12 balls of light grey 945.0003 and LANGYARNS CASHSOFT BABY (recycled cashmere, extra fine merino) 375/450 g = 15/18 balls of light grey 970.0003. Circular needle, 5mm (US 6, UK 8), 60 cm (24“) long.